BRITE-Constellation is an international space astronomy mission consisting of a fleet of 20x20x20 cm nanosatellites dedicated to precision optical photometry of bright stars in two photometric colours. The mission continues in full science operations, with 15 data releases to BRITE target PIs having already taken place, and many datasets available in the public domain from the BRITE public archive. The most recent Call for Proposals closed on 01 December 2016, and 15 new proposals for observation were evaluated. More information about the mission is available on our website: www.brite-constellation.at. General inquiries about BRITE Constellation should be directed to the BEST Chair, Andrzej Pigulski, Univ. Wroclaw, Poland (pigulski@astro.uni.wroc.pl) or to Canadian PI Gregg Wade, RMC (wade-g@rmc.ca). There are five operating BRITE satellites in the Constellation, collecting data on various sky fields in a coordinated programme to obtain well-sampled, long-term continuous (~6 months) light curves in both red and blue bandpasses. BRITE Toronto (Canada): Toronto observes with a red filter. It has recently completed observations of the Auriga/Perseus field, and continues to observe the Vela/Pictoris field. The Arae/Scorpius field has recently been introduced as the new switch field. BRITE Lem (Poland): Lem observes with a blue filter. It has recently completed observations of the Auriga/Perseus field and continues on the Vela/Pictoris field. The next switch will be to the Sagittarius field when it comes into range in late March. BRITE Heweliusz: Heweliusz observes with a red filter. This satellite is observing the Carina field and potential switch fields are under investigation. One potential option is Lyra/Herculis. UniBRITE (Austria): UniBRITE observes with a red filter. It has completed the Orion field and continues on the Carina field. The next switch will be Sagittarius when it comes into range in late March. BRITE Austria (Austria): BRITE Austria observes with a blue filter. It has completed the Orion field and continues on the Vela/Puppis field. The next switch will be Sagittarius when it comes into range in late March. The BRITE Constellation observing programme from early 2017 through mid-2018 has been planned by the BRITE Executive Science Team (BEST), and details are available on the BRITE photometry Wiki page. 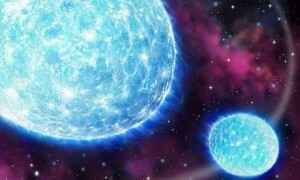 Artist’s conception of Iota Orionis. “The Most Massive Heartbeat: An In-depth Analysis of iota Orionis” (Pablo et al. 2017, MNRAS, in press): BRITE observations of iota Orionis have revealed tidal interactions between the hot components of this massive 29d period binary system. The tidal distortions of the stars lead to a unique photometric signatures known as a “Heartbeat”, due to qualitative similarities to the “normal sinus rhythm” signal of an electrocardiogram. Pablo et al. model the BRITE photometry in tandem with ground-based spectroscopy to measure the masses and radii of the components, revealing iota Ori to be the most massive known heartbeat system. In addition, they report the unprecedented discovery of multiple tidally induced oscillations in the O-type primary star, from which they empirically estimate the tidal circularization rate. This discovery was recently covered in the popular press. The 3rd BRITE Constellation Science Conference will be hosted in Canada in August 2017. The conference, entitled “New scientific and technical achievements with BRITE”, will take place at the Auberge du Lac Taureau, located 2.5h north of Montréal, from 6-10 August. The first announcement is imminent. The BRITE Public Data Archive is based in Warsaw, Poland, at the Nikolaus Copernicus Astronomical Centre. The mission Wiki includes information on past, current and future fields. BRITE Constellation is now on Facebook, at @briteconstellation. The BRITE International Advisory Science Team (BIAST), which consists of BRITE scientific PIs, technical authorities, amateur astronomers, and mission fans, advises the mission executive on scientific and outreach aspects of the mission. If you’re interested to join BIAST, contact Canadian BRITE PI Gregg Wade: wade-g@rmc.ca.